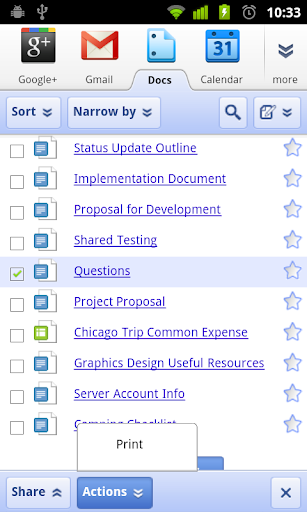 Today we’re making it possible to add page numbers and page count to your documents. You can use the Insert > Page number option to add page numbers to the header or footer of your documents. Go to Insert > Header. Click the right align icon in the toolbar to move the cursor to the upper right corner. 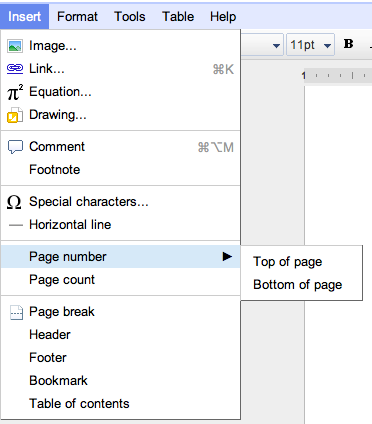 Go to Insert > Page number > Top of page to add page numbers to the headers of your document. Go to Insert > Page count to add the total number of pages to the headers of your document. Earlier this year, we announced Google Cloud Print for mobile documents. Google Cloud Print is a service in Beta that allows printing from any app on any device, OS or browser without the need to install any software. We’re making it easier to print on the go directly from your mobile documents list in Google Docs. Simply select a document from the documents list and click on Actions > Print from the bottom toolbar. Currently, you can use Cloud Print in Google documents and spreadsheets. To get started, you’ll need to connect your printer to Google Cloud Print. To learn more, check out the new site. We hope you’ll take advantage of these latest features. Stay tuned for the next This Week in Docs. This week in Docs, we’re announcing page numbers and page count in documents, plus one click to Google Cloud Print -- a couple features that we hope will save you time and energy.